Capitol Connect: Bonding and appropriations bills introduced! We enter week three of a short 13-week legislative session going full steam. 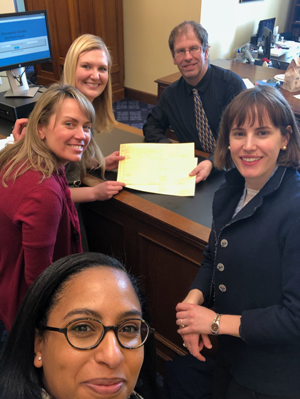 With the energy of a positive February forecast, increased bipartisan interest in housing, and Governor’s Task Force on Housing beginning to host regional forums throughout the state, MHP’s policy team continues to gain legislator support for our 2018 policy priorities. Earlier this week, we were delighted to participate in Homeless Day on the Hill, which set a record of 850 registrants. Advocates from all over the state took over the Capitol for meetings with legislators, and packed hearing rooms on bonding and housing policy hosted the same day. Thank you to all who participated! With strong bipartisan support, the Homes for All bonding bills have been introduced in the House (H.F. 3125) and Senate (S.F. 2939). On Tuesday, advocates packed a hearing in the House Capital Investment Committee, urging lawmakers to support the $140 million in bonds for housing — $100 million for Housing Infrastructure Bonds and $30 million for General Obligation bonds. MHP’s Local Housing Trust Fund bill is included in the Homes for All Minnesota Housing Finance Agency appropriations package. Rep. Dave Baker (R- District 7B) is the chief author and a handful of other co-authors have been secured. Yesterday, Homes for All dropped that bill into the hopper for introduction today. The Homes for All appropriations package to fund programs to prevent and end homelessness in the Department of Human Services was also introduced in the House and Senate. 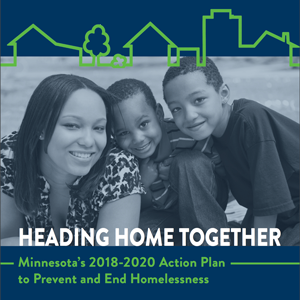 ​At Homeless Day on the Hill, dozens of partners and participants released "Heading Home Together," a 2018-2020 action plan to end homelessness in Minnesota. The new plan reflects local practitioner knowledge, the insights of people with lived experience of homelessness, federal policy requirements and guidance, and extensive input from stakeholders all across Minnesota. MHP is proud to support this new effort! Watch a video of the public release and read the full plan. Last month, Minnesota Management and Budget released its February forecast, showing a $329 million surplus for the current budget cycle and $303 million for FY 2020-21. In contrast to the November forecast that showed a deficit for the 2018-19 biennium, the February forecast means legislators aren't scrambling to fill a budget hole, but instead managing modest growth. This is a positive sign for the MHP and Homes for All legislative agendas, as we continue to work hard during the 2018 legislative session. Read more here. Big news: Senator Carla Nelson (R- District 26) has offered to chief author MHP's tax credit bill, which will go "in the hopper" this week for introduction. The tax credit, modeled on a successful tax credit program in North Dakota, encourages local businesses and neighbors to invest in their community by creating housing opportunities. Thank you to Senator Nelson for her leadership! Stay on top of deadlines! House and Senate leadership have set deadlines for committees to complete their business this session. March 22: Committees must act favorably on bills in the house of origin. March 29: Committees must act favorably on bills, or companions of bills, that met the first deadline in the other body. April 20:Committees must act favorably on major appropriation and finance bills. The deadlines do not apply to the House or Senate Capital Investment or Taxes, Ways and Means (House), Finance (Senate), or Rules and Legislative Administration committees in both bodies. Submit your ideas on how to promote homeownership, rental housing, and housing stability for households with the lowest incomes or facing the largest barriers to securing housing to Governor Dayton's Task Force on Housing by March 15. Click here to learn how to submit your ideas. The Task Force is also launching a series of regional housing forums, starting in Austin on March 14. Learn more and register. At its February meeting, the board of the Minnesota Housing Finance Agency heard highlights from the 2017 Program Assessment, approved the release of the proposed Housing Tax Credit 2020 Qualified Allocation Plan (QAP) for public comment, discussed the implications of a potential change to the administration of the project-based Section 8 program, and received an overview of the state's Draft Analysis of Impediments to Fair Housing Choice. Read the full meeting notes. While the Housing Tax Credit 2020 Qualified Allocation Plan is not billed by the Minnesota Housing Finance Agency as a major change, there are proposed changes in three categories based on their impact on: 1) projects with 9% credits allocated through Super RFP; 2) tax-exempt bond / 4% projects selected through the competitive RFP process; and 3) projects receiving tax exempt bonds through MMB and seeking an allocation of tax credits through the 4% only process. Comments are due March 14; more information and ways to provide feedback here. In response to the state's Draft Analysis of Impediments to Fair Housing Choice, MHP submitted comments commending the state for being proactive in utilizing the new Affirmatively Furthering Fair Housing tool, while elevating key priorities like incorporating more of the action steps from the Twin Cities Regional AI Addendum, recognizing displacement and loss of affordable units as a fair housing issue, and placing additional focus on housing that serves the needs of household earning 30% AMI or less. Read the full comments. National Rural Housing Coalition: Once again, the president's budget zeroes out funding for USDA Rural Housing programs for Fiscal Year 2019. The National Rural Housing Coalition is calling on rural advocates and organizations to ask Congress to protect rural Americans by supporting the rural housing programs which are essential to their communities. Sign on by March 12, 2018. National Low Income Housing Coalition: NLIHC is circulating two letters urging Congress to ensure affordable housing and community development programs receive the highest allocation of discretionary funds possible for FY19; and oppose any proposals that would cut housing benefits by increasing rents and imposing onerous and administratively wasteful work requirements on current and future tenants. Learn more and sign on to these letters by March 16. Secretary of Housing and Urban Development (HUD) Ben Carson announced a change to the agency’s mission statement: removing “promises of inclusion and discrimination-free communities.” The new mission statement promotes “self-sufficiency.” MHP has signed on to a letter opposing this change. The Governor’s Housing Task Force wants to hear from you! Join the first Regional Forum hosted at Riverland Community College in Austin, Minnesota to share your ideas, and help craft housing strategies that will work for your region. Learn more and register here. Get updates from the capitol and learn how to get involved in the Homes for All coalition this legislative session! Join us from 10 a.m. to 12 p.m. at Lutheran Social Services in St Paul. More information (and call-in directions for remote participation) here. Have you been directly impacted — or do you work with communities that have been directly impacted — by the lack of affordable housing in the Twin Cities? Please join us on March 15 to learn more about the mission and goals of the Speakers Bureau and to co-create its principles and structure. More information here!